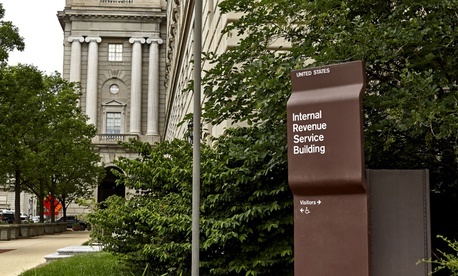 Despite an untimely hardware outage on this April’s Tax Day, the Internal Revenue Service overall improved its performance in handling the 2018 filing season, a watchdog found. The fly in the ointment was continued delays in catching up on back correspondence, auditors said. But GAO credited the service, which has seen its workforce cut by more than 10,000 full-time employees and its budget sliced by $658 million (5.5 percent) between fiscal 2013 and 2018, with steady progress in implementing the massive Tax Cuts and Jobs Act enacted last December. From Jan. 1 through April 21, GAO reported, the IRS, “answered 80 percent of calls seeking live assistance, which is a slight increase from about 79 percent for the same period last year, and reduced the average caller’s wait time to speak to an assistor from 6.5 minutes to 5.1 minutes. This marks the third year of measured improvements since IRS reached a low of a 37.5 percent level of service in 2015 with a 23.1-minute average wait time,” auditors wrote. Also encouraging for agency leaders was the increasing number of taxpayers using online services at IRS.gov, including the tool for viewing account balances. IRS units were late, however, in responding to some 37 percent of written correspondence as of the end of the 2018 filing season, up from about 26 percent at the same time in 2017. This “overage,” as staffers call it, has been a past concern of GAO, which has recommended that Treasury Department officials make it a performance goal. The good news was that the Tax Day system outage did not prevent the IRS from meeting its targets for handling individual returns, despite some difficulty hiring seasonal employees to transfer data from paper to electronic format, a position “perceived as undesirable in a low-unemployment environment,” the report noted. All this was done at the same time the agency was assembling a Tax Reform Implementation Office. The agency’s Human Capital Office has called for hiring of 1,100 new staff to fill positions “requiring a variety of competencies and provide additional training on tax law for current employees,” GAO noted. To implement 119 provisions of the new law, IRS planners seek staff to interpret the statute, create or revise some 500 forms, publish related guidance, reprogram 140 interrelated return processing systems and conduct extensive “taxpayer outreach,” GAO said. GAO commended the IRS Human Capital Office for its new attendance at weekly planning meetings for the new tax law, and recommended that Treasury focus more on accelerating the stalled correspondence with taxpayers. IRS managers largely agreed, though expressing a different interpretation of the data on tardiness.